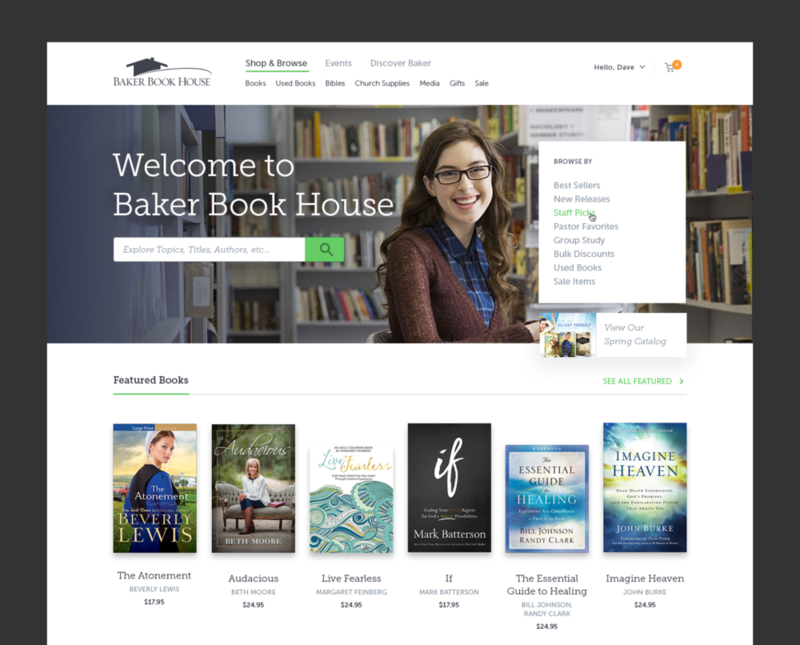 I worked with Elevator Up to lead the efforts of updating Baker’s retail site to a responsive e-commerce platform. The resulting re-design saw a 10% increase in revenue for the company. Baker Book House opened its’ first bookstore in Grand Rapids, Michigan in 1939, and started publishing books the following year. Since then it’s grown to become one of the largest Christian book publishers today. Our discovery process included competitive analysis, feature scoping, and information architecture. We built user flows and conducted interviews at brick-and-mortar locations to gain insights on our hypotheses before moving into design. We strategically started with the product pages first due to the foreseeable technical complexities of many third-party integrations, including: multiple book formats per title, powered by unique urls and several CMSes (including inventory linked to manual user input during retail store checkout) —to name a few. This approach allowed us to allocate an adequate amount of time to the pages that were both visually involved and richest in functionality.